Is that Photoshopped or is it real? The title of this article is a very common question that digital photographers get asked. While often an innocent question it’s rooted in the misconception that “digital photography is fake and that film is real.” Neither portion of that statement is inherently correct and there really isn’t any difference between the two. The tools and processes that photographers use in Photoshop (PS) are nearly all derived from darkroom techniques. The darkroom, both chemical and digital, is still an important part of the process. Ansel Adams maintained that the negative was much like a musical score. It contains all of the information but requires an orchestra to complete the performance. He considered the photographic print, to be the performance. Recently, I stumbled upon the following quote by him: “Dodging and burning are steps to take care of mistakes God made in establishing tonal relationships.” The goal of the fine art photographer is to deliver their own artistic vision of a scene to the viewer, using whatever tools are available. A successful photograph instills the same emotions and feelings in both the photographer and the viewer. In terms of recording the human experience, the camera is a very poor tool. Our eyes see a much wider range of light than the camera can capture. In addition to the visual limitation of the camera, all of our other senses help deliver on the moment. Wind, temperature, humidity, motion are all part of the original experience but not directly captured by the camera. It’s the job of the photographer to use the tools available to give you that sense of “being there.” Ansel Adams didn’t take his film to the local pharmacy for development; neither should you. This following photograph is a fine example. It was taken, shortly after sunrise, on summer morning in the Yosemite backcountry. 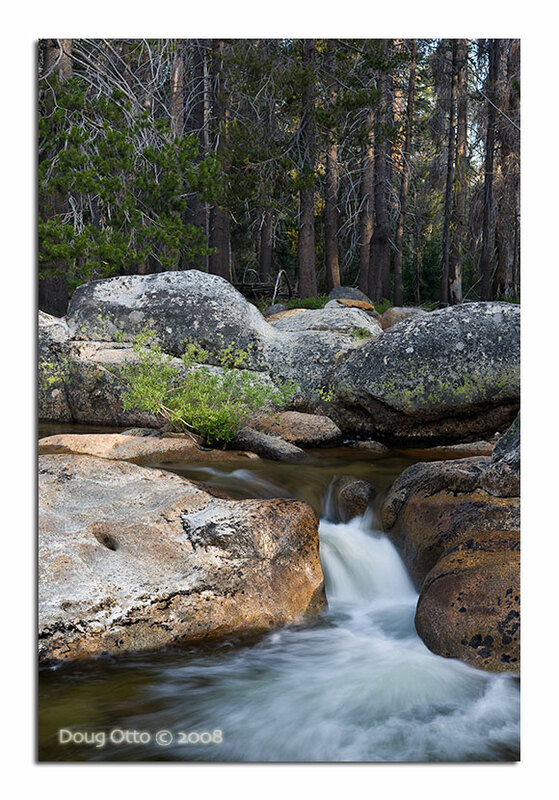 Bonnie and I had backpacked in from the Tioga road and made our camp along Yosemite creek. This was our front porch and where we enjoyed the morning’s first cup of coffee. It was a really pleasant spot, far from the crowds in the valley. I took this while standing in the stream, where the water for the coffee came from. This image has a few problems. The sun was just coming over a ridge to our East and lighting up the surrounding trees. That light hadn’t yet reached the stream. That difference in brightness made the exposure a challenge. If I exposed to accurately depict the light in the trees, the stream would have been a dark shadow. To make the range of light manageable I used a graduated neutral density filter to bring down the light in the trees. The result was that I captured the scene as the camera was able to see it. The problem is that the resulting photo looks nothing like the scene in real life. It looks cold and flat. This is clear example of why processing our images needs to garner as much attention as their capture. To bring this image to life I adjusted the digital white balance (WB) to make it feel much warmer. In the days of film we used different films, daylight, tungsten, cloudy, etc. to achieve this same goal. Next I brought it into Photoshop. I dodged and burned the image to recover the range of light and shadow detail that was lost by the limitations of the camera. The resulting image is much truer to the actual experience. It feels warm and the light in the trees appears as it really was. Photoshop, as well as the traditional darkroom, can certainly be used to deceive and I believe that is where the negative connotation stems from. My goal, however, is to produce an image that produces an emotional response and is true to my recollection of the scene. Maintaining that “image honesty” is important to that craft. I also choose to shoot all of my images in RAW format. I prefer to maintain control over the processing of the image rather than allowing a piece of software, in the camera, to make creative choices for me. 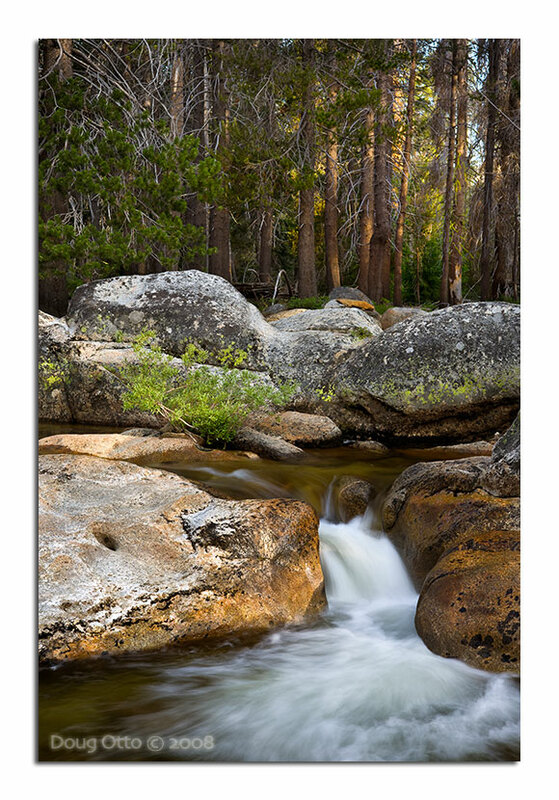 This entry was posted in Photography, Random Thoughts and tagged Camera RAW, digital darkroom, dodging and burning, doug otto, photoshop, yosemite. Bookmark the permalink.